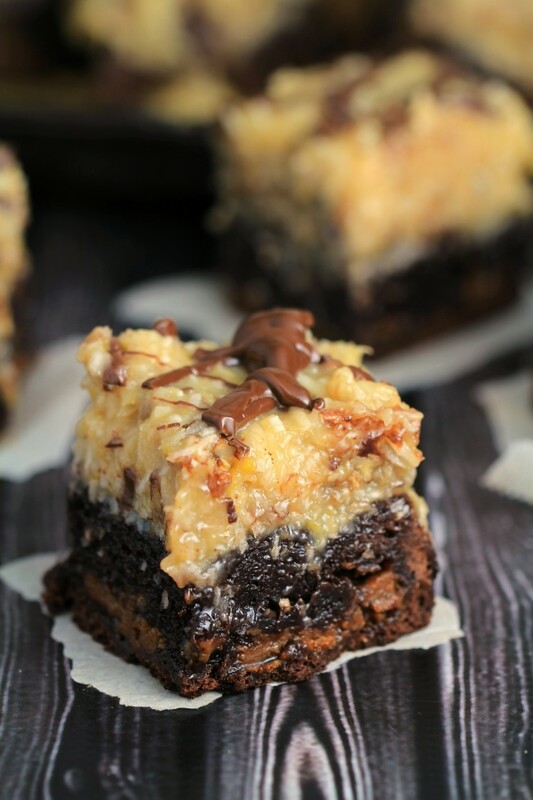 Caramel Stuffed German Chocolate Brownies - Frugal Mom Eh! 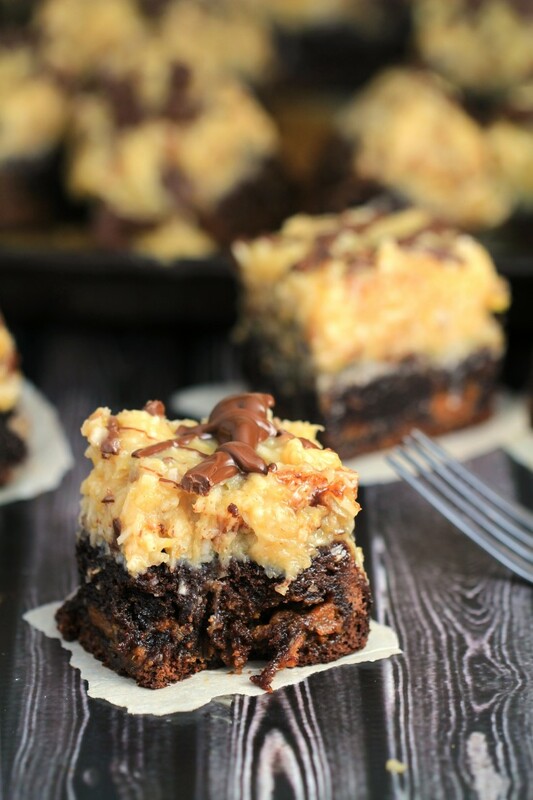 These Caramel Stuffed German Chocolate Brownies are a decadent dessert inspired by German Chocolate Cake with a surprise twist that sets them apart from any other brownie you have ever baked before! 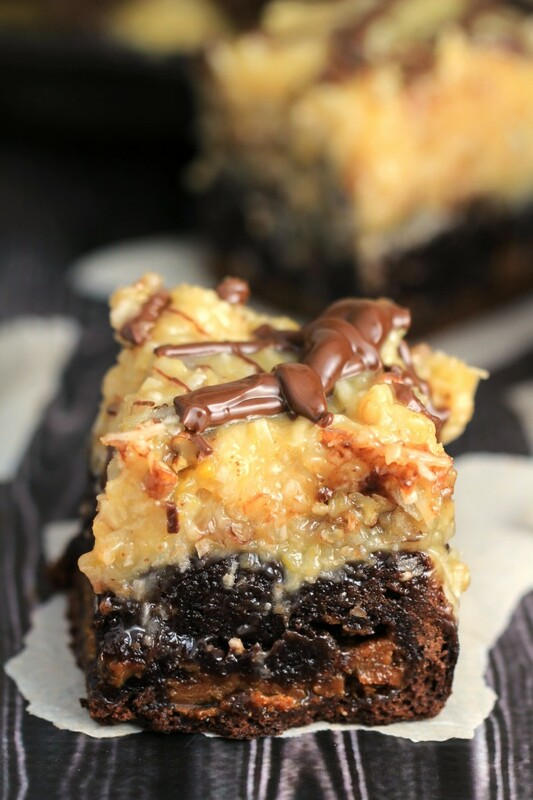 German Chocolate Cake actually did not originate in the country of Germany. The original recipe called for a specific brand of baking chocolate, which was named after the man who developed it, Sam German. Growing up my mom did most of the baking, however on occasion my dad would pull together an amazing dessert. 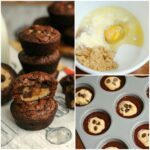 Chocolate haystack cookies, chocolate mousse and my favourite – German Chocolate cake! 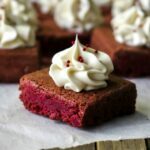 There is just something about this decadently sweet brownie with its satisfying texture that I can’t get enough of. Can you blame me? Prepare a 9 inch pan by lining it with parchment paper. Melt Caramels in a microwave safe bowl with milk in 45 second increments until melted and smooth. Set aside. Pour in 1/3 of brownie batter into the pan and level it out with a spatula. Carefully pour caramel sauce over brownie batter then spoon the remaining brownie batter over the caramel sauce and carefully level it out. Bake in middle of the oven for 33-34 minutes, or until a toothpick inserted comes out clean. Set aside to cool in pan. 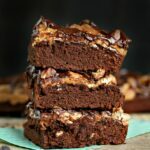 Stir in coconut and pecans then remove from the heat and allow the mixture to cool slightly before pouring over the baked brownies, smoothing it out with a spatula. In a small bowl, melt the chocolate and coconut oil in 45 second increments until melted and smooth. 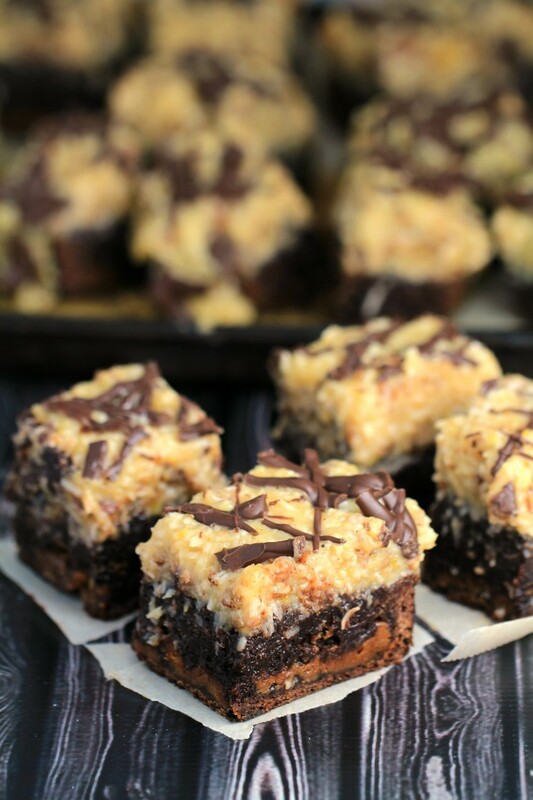 Using a spoon, drizzle the chocolate over the top of the coconut mixture. 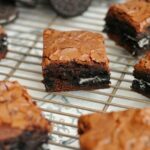 Oh wow, I think these have to be the best brownies ever!! so so so good!!! Oh my goodness hunny! These look awesome! Oh my, these look so good. 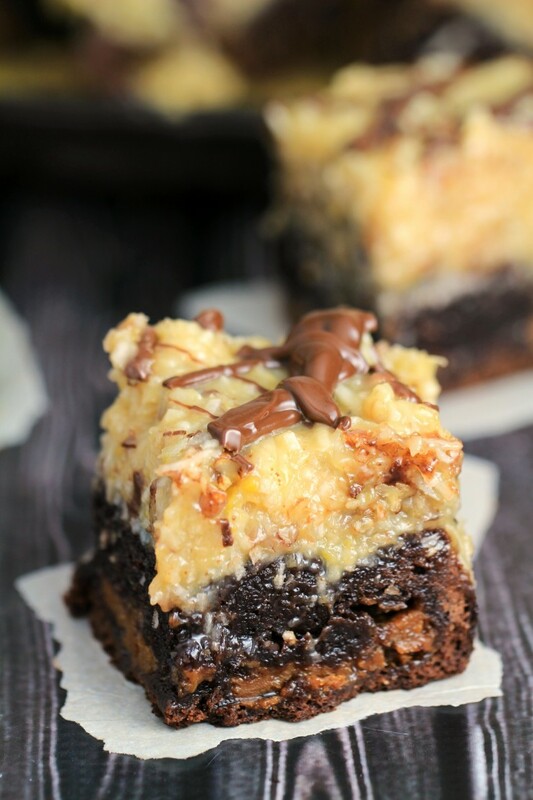 I love brownies and i love German chocolate cake and i love caramel. Put it all together is a dream come true. Unfortunately due to being a diabetic I can no longer enjoy such delicious sweets. But i have a vivid imagination and can imagine how awesome these would taste. This is, as you say, a decadent brownie and quite delicious as well. I have saved this recipe. Thank you for sharing with us. 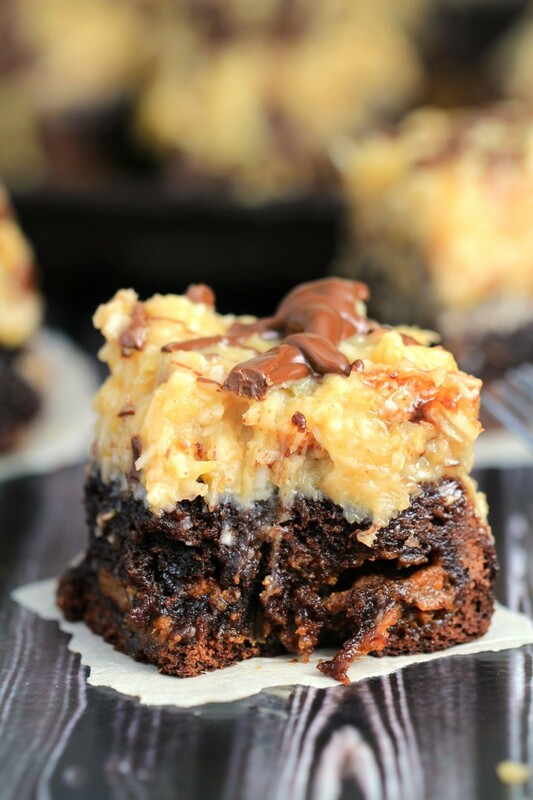 This is a decadent brownie, to say the least. Adding chocolate chips and melted caramels puts it higher up that scale-quite possibly very near the top. 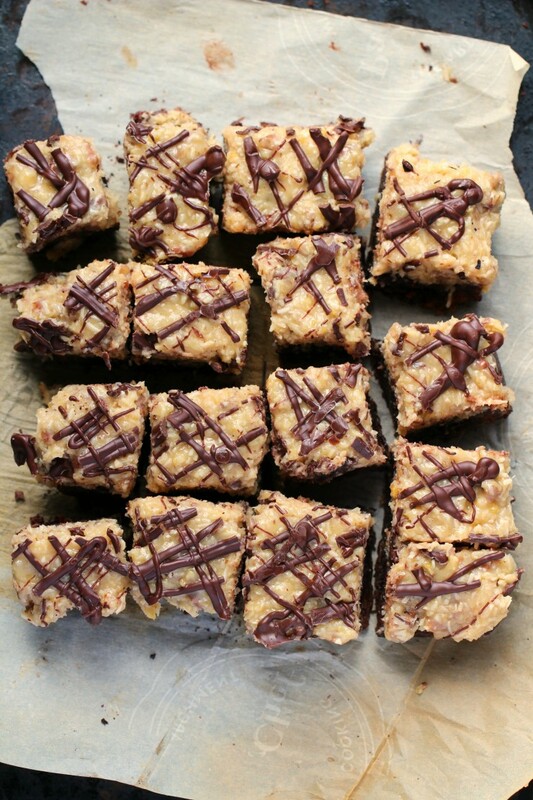 Thank you for sharing this recipe with us.